Nas still looks like the best short because it could drop back to 5,000, down more than 20% from here. That still wouldn't take AMZN or NFLX below 50x earnings – nor half the rest of the index. SQQQ is at $16.45 and, in the STP, we now have 80 of the June $12 ($5.40)/17 ($3.40) bull call spreads at $2 and that's going to pay over 100% UNLESS The Nasdaq goes higher than it is now. 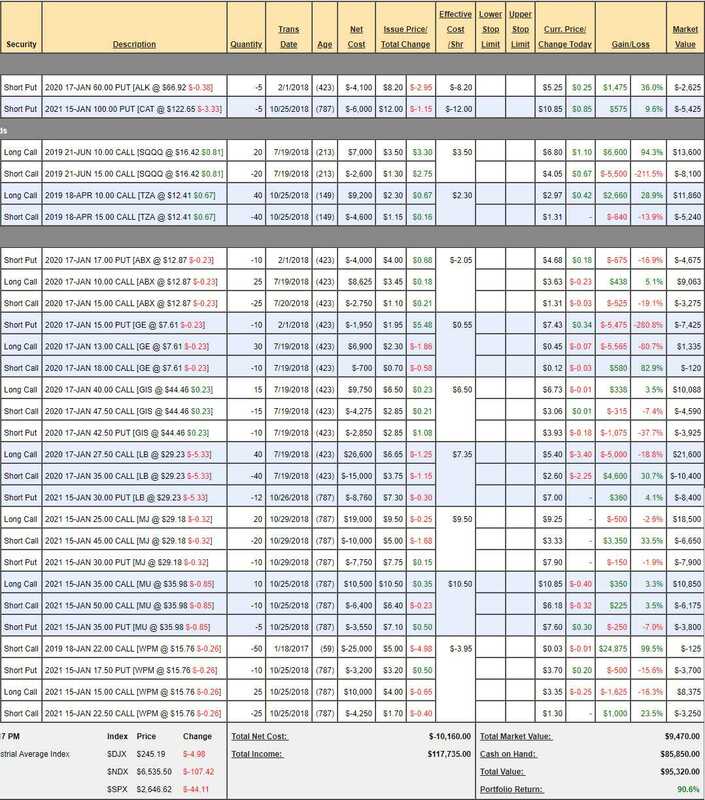 That's net $3,400 on the $56,000 spread that's $12,000 in the money to start so you can't lose you're $3,400 unless the Nasdaq improves and, if it does improve, it's not likely AAPL will be much lower. If, on the other hand, AAPL is below $170, it's not likely SQQQ isn't paying you most of that $56,000 back and you are only obligated to own $85,000 worth of AAPL stock so, as a stand-along – the worst likely case is owning 500 shares of AAPL for net $29,000 ($58/share) but more likely you have some very good downside protection. Note the SQQQ spread is $10,000 and and currently net $5,500 so more coming if we stay down but not much. I'm not too worried, they are all good positions but I wish I could make adjustments. This entry was posted on Tuesday, November 20th, 2018 at 2:34 pm and is filed under . Both comments and pings are currently closed.